Your Yearly Revenue Goal is a representation of the lifestyle you want to live each year. At Harpoon we encourage you to take some time to inventory your current lifestyle. Everything from food and housing, to health insurance and savings; from office expenses and vacations, to clothing and retirement; brainstorm all the different categories of your personal and business life that you need to account for. 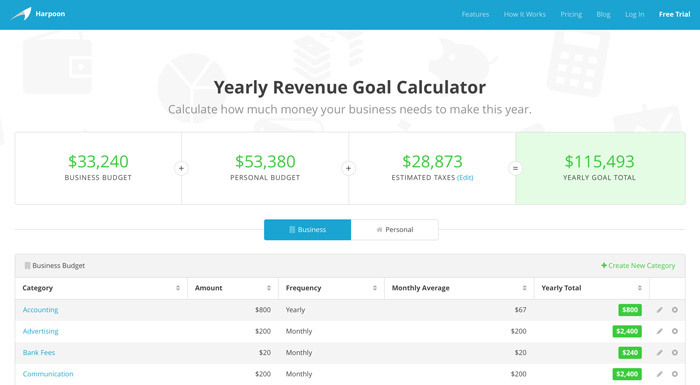 Then using Harpoon's Yearly Revenue Goal Calculator you can determine the specific cost of your current lifestyle. This calculator will help you think through all the budget categories you need to account for, both in your personal and business life—things like health insurance, retirement, food, housing, etc. The end result will be your yearly revenue goal—the amount of money it’s going to take in order to support the lifestyle you want to live each year. Note: We've written a tutorial on how to use the calculator. You can read it here. In your Harpoon account there’s a place where you can set your yearly revenue goal. If you view your General Settings you’ll find a form field where you can edit your goal. Your yearly revenue goal isn’t set in stone. Feel free to edit it whenever you’d like. Maybe each year you want to increase it by 10% as encouragement to keep growing your business. You can even change it temporarily just to see how it affects the different metrics throughout your Harpoon account. The bottom line is we encourage you to build a business that supports your ideal lifestyle. Coming up with a yearly revenue goal is the first step to making that a reality. To learn more about setting goals view the Revenue Goals articles.